On the Empire’s northeastern edge, perched on the giant rocks that tumbled down into the swirling waters of the Auroral Ocean can be found the Freeholds of Nar. Once a string of fortresses belonging to the doughty dwarfs who mined, prying gold and jewel from the stone’s tight grip. The wealth unearthed and the skill of the artisans established the holds as a place of wonder and riches, a reputation that lasted until, one day, the ring of hammering went silent, the light of torches guttered out, and the dwarfs who had made the place their home disappeared. Today, the Freeholds of Nar is a stark place of stubborn people. Founded by the desperate on the bones of the dead, each generation fears this year will be the year the Empire comes to bring them back under the lash. That fear has made them strong, but has also eaten at their minds and hearts. 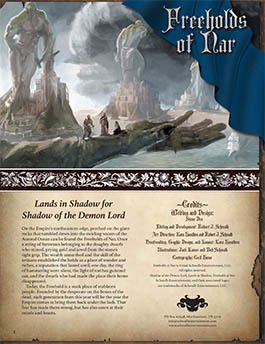 The Lands in Shadow series takes a closer look at the most important places on the continent of Rûl to give you what you need to explore these fantastical and often terrifying locations. Buy Freeholds of Nar in PDF from Schwalb Entertainment or DriveThruRPG today!